I don’t know about you, but if I buy a package of Oreos it takes every ounce of willpower I have to not eat the entire package of Double Stuf Oreos in one sitting. 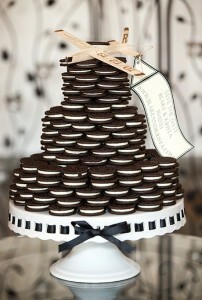 Which means I’m totally in love with this Oreo cookie wedding cake alternative. What’s not to love? It’s made completely of Oreo cookies. Just give me a big glass of ice cold milk and I’ll see you later. In all seriousness (Oreos are serious business after all) I really do love this idea. 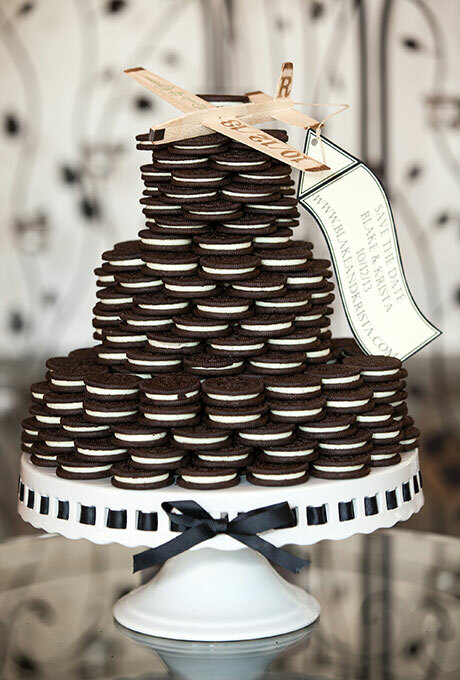 We’re talking about a three-tier “cake” created entirely of Oreo cookies. Even if you still want to do a traditional wedding cake this would be amazing as a dessert table or even as a “kid wedding cake” for the younger crowd. You could set it up with small cartons of milk and everyone could enjoy a milk and cookies. Your guests will love this. Trust me. And with all the different Oreo varieties out there you could personalize this any way you like. Think about it – Halloween Oreos for a fall wedding, or the green and red Oreos for a winter wedding. This was created by Viewpoint Catering and the photo was taken by Cariad Photography. You can find this amazing Oreo cake here.